A quick weeknight meal that doubles as lunch the next day. I included two sides that go well with the meatballs and are much healthier than pasta. Perfect for anyone watching their carbs. Before you assemble the meatballs, make sure to wring the liquid out of the defrosted spinach or you’ll have a giant soupy mess. In a small bowl, add milk to the oats and set aside. In a large bowl, add the spinach, onion, garlic, egg, grated cheese to the turkey. Now add the oat mixture to the turkey and mix well with your very clean hands. Roll into balls (golfball size) and place on a sheet pan. 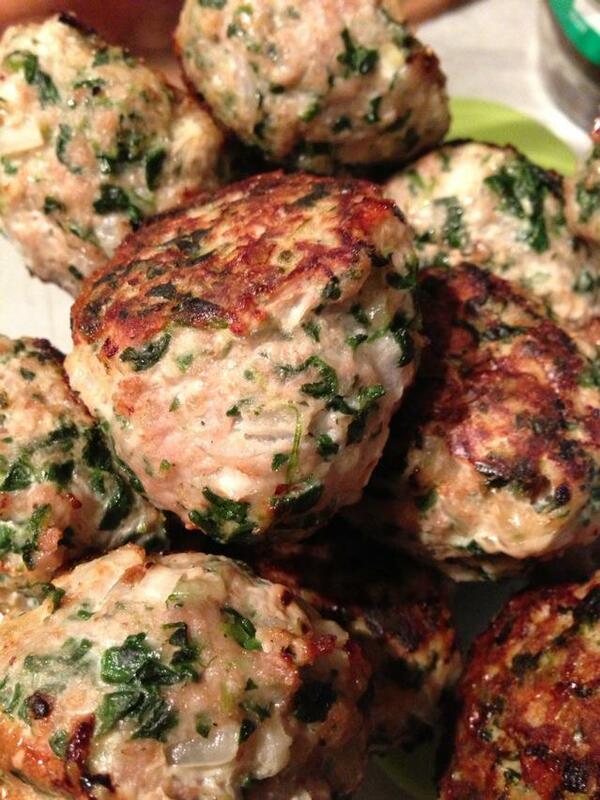 Drizzle with olive oil and bake at 400 degrees for 20-25 minutes, flipping meatballs after 10 minutes. Makes 12-15. Serve with marinara (recipe below). Over medium heat, heat oil in a large pot until hot. Add onion and garlic, saute for a few minutes until the onions begin to appear translucent. Stir in the tomatoes, dried herbs, honey, salt and pepper. Lower the heat and continue to simmer for 30 minutes, uncovered. Stir occasionally. Just before you turn off the heat, stir in fresh basil. To serve, spoon sauce on the bottom of plate, top with meatballs and sprinkle with freshly grated parmesan cheese. Toss a head of cauliflower florets with 2 TBSP olive oil and 1/4 tsp salt in a large bowl. Spread in 1 layer in a 9×12 glass baking dish and roast, stirring occasionally, until tender and golden brown, approximately 30-40 minutes, give or take a few. Sometimes I cover with foil for the first 20 minutes so it can steam a little and then uncover it for the last 20 so it can brown. Try it and figure out the way you like best or how your oven cooks. Grate or sprinkle with parmesan cheese. Serve warm. Cut the squash in half and scrape out the seeds, just like you would do any winter squash or pumpkin. Drizzle the inside with olive oil, sea salt and fresh cracked pepper. Put the halves flesh side down on a sheet pan and roast for 35 – 45 minutes, depending on size of the squash. Let cool enough to handle, then flip the squash over and scrape out the cooked strands with a fork. You can serve with more marinara and parm, or simply on the side of the meatballs, if you wish.